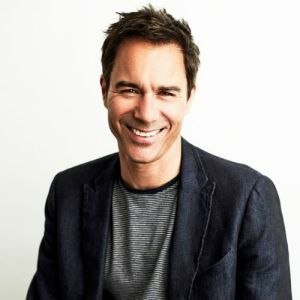 Eric McCormack is an award-winning actor, director, and producer, known for his role as Will Truman in the American sitcom Will & Grace and as Grant MacLaren in the hit Netflix series Travelers. Born in Toronto, McCormack began his acting career performing in high school plays. He left Ryerson University in 1985 to accept a position with the Stratford Shakespeare Festival, where he spent five years performing in numerous productions. He made his feature film debut in the 1992 science-fiction adventure film The Lost World. McCormack appeared in several television series, including Top Cops, Street Justice, Lonesome Dove: The Series, Townies, and Ally McBeal, before gaining worldwide recognition for playing Will Truman in Will & Grace, which premiered in September 1998 and ran until 2006, before returning to the air in 2017. His performance has earned him six Golden Globe nominations (including in 2018 following the renewed season) and four Emmy nominations, ultimately winning the Primetime Emmy Award for Outstanding Lead Actor in a Comedy Series in 2001.